Moderate to Exceptional drought levels (D1 to D4 on U.S. Drought Monitor scale) increased to 65.45 percent, up from 64.82 percent a week ago, while Severe to Exceptional drought levels (D2 to D4) covered 42.12 percent of Contiguous U.S., an increase of more than 1 percent. [September 27, 2012] Mass die-offs resulting from human impact and the planetary response to the anthropogenic assault could occur by early 2016. Forty-six additional counties across the Dakotas, Hawaii, Minnesota and Wisconsin have been declared agricultural disaster areas (includes both primary and contiguous designations) due to damages and losses caused by the recent drought, the U.S. Department of Agriculture (USDA) reported. [September 21, 2012] Mass die-offs resulting from human impact and the planetary response to the anthropogenic assault could occur by early 2016. The states are Alabama, Georgia, Iowa, Minnesota, Missouri, North Dakota, South Dakota and Wisconsin. 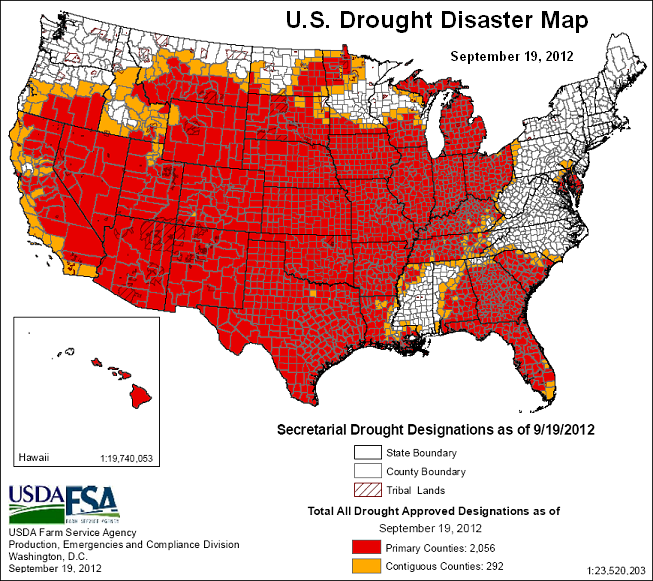 As of September 19, 2012 a total of 2,348 counties across 43 states have been designated as agricultural disaster areas due to the drought, this year. 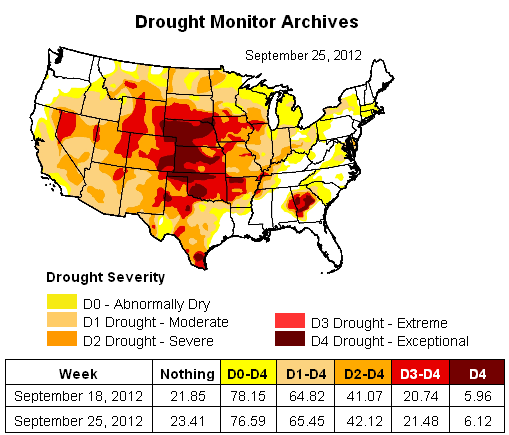 U.S. Drought Disaster Map, September 19, 2012. Source: USDA. Edited for brevity by FIRE-EARTH. 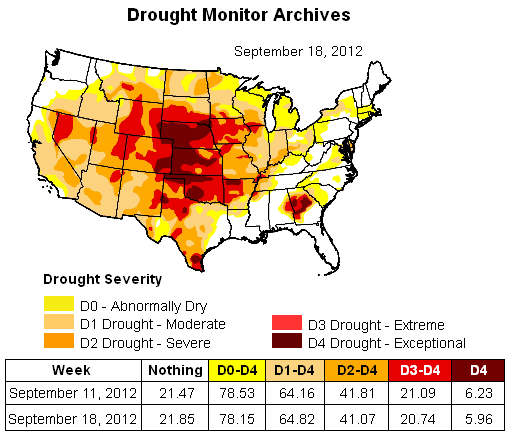 Drought has set yet another record high in the 12-year data, U.S. Drought Monitor reported. Nearly two-thirds (64.82 percent) of Contiguous United States (54.25 percent of the country) is now in moderate drought or worse, the largest percentage ever recorded at that level. Average temperature over global land and ocean surfaces was the 4th highest on record for August, at 61.22°F (16.22°C) or 1.12°F (0.62°C) above the 20th century average, NOAA reported. August 2012 was the 36th consecutive August and 330th consecutive month with a global temperature above the 20th century average. Global land temperature was 58.52°F, which tied with 2001 and 2011 as the second warmest August on record, behind 1998. Temperature for global land and ocean surfaces for June–August tied with 2005 as the third highest on record for this period at 61.25°F (16.24°C), or 1.15°F (0.64°C), above the 20th century average. [September 12, 2012] Mass die-offs resulting from human impact and the planetary response to the anthropogenic assault could occur by early 2016. USDA has designated about 400 additional counties across 14 states as both primary and contiguous disaster areas due to drought, excessive heat. The states are Alabama, North Carolina, North Dakota, South Dakota, Iowa, Kentucky, Minnesota, Mississippi, Missouri, Montana, Tennessee, Virginia, Wisconsin and Wyoming. 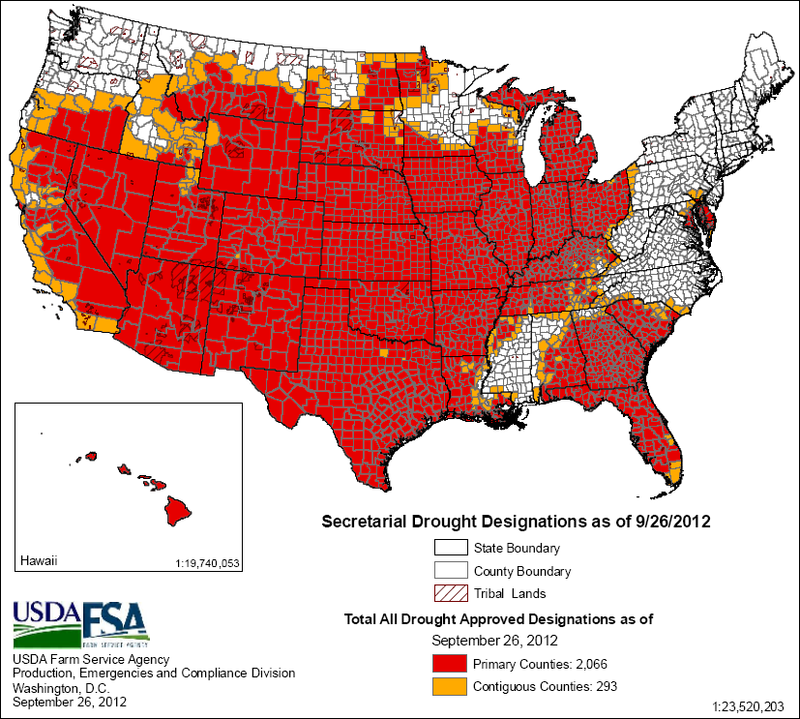 As of September 12, 2012 USDA has designated 2,341 unduplicated counties across the country as agricultural disaster areas due to drought. 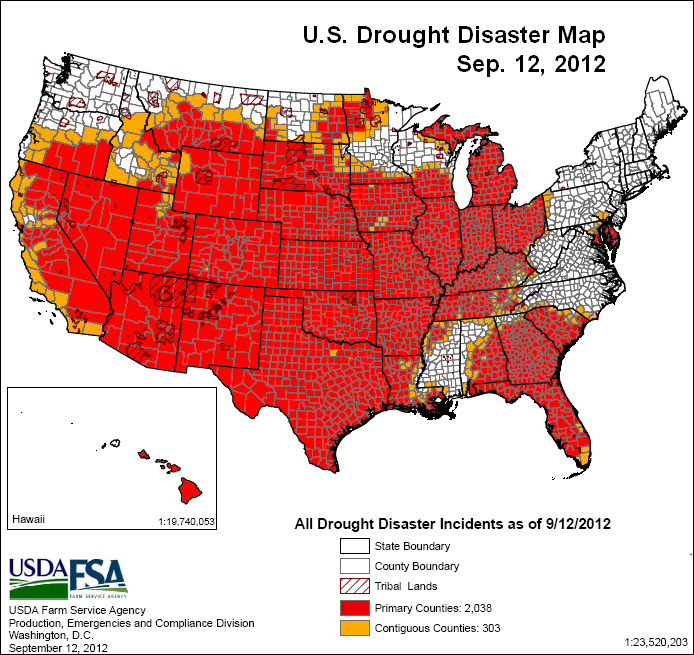 U.S. Drought Disaster Map, September 12, 2012. Source: USDA. Edited for brevity by FIRE-EARTH. [September 11, 2012] Mass die-offs resulting from human impact and the planetary response to the anthropogenic assault could occur by early 2016.